I'm a snacker. I've never been one to eat three large meals, instead I eat 6-7 small meals every couple of hours throughout the day. This has been the way I have eaten as far back as I can remember. Growing up I was heavily involved in dance and swimming so I got used to eating small meals to keep my blood sugar steady and my stomach from feeling heavy. I'm lucky that I have a high metabolism, but it also has the effect of making me want to snack all the time. It seems that my two sons have inherited my love of snacking and by the time my oldest comes home from school he is more than ready for a snack. I am always looking for snacking options high in protein and I was interested when I ran across a recipe for Edamame Hummus in a recent issue of Martha Stewart Living magazine. This recipe has 6 ingredients. It takes one hour and fifteen minutes, 15 minutes of which is active and makes 6 to 8 servings. I had no problems finding any of the ingredients at my local grocery store and made no ingredient modifications. I did add more than the suggested amount of Tahini, probably twice as much since I love the taste. Make sure to taste the hummus after it has been salted before adding more lemon juice. The salt makes a significant difference in the taste so wait to taste for additions until after the hummus has been salted. I allowed the hummus to sit in the fridge overnight to allow for the full flavor to come out. I followed the remainder of the recipe as written. The nutty flavor from the edamame is delicious in this recipe. My husband was particularly found of this recipe and ate more than half by himself. It was a great after-school snack for my oldest and held his energy and hunger until dinner. I liked that this recipe offered a different spin on traditional hummus and a great source of protein. This will definitely be a recipe I will be making again in the future. 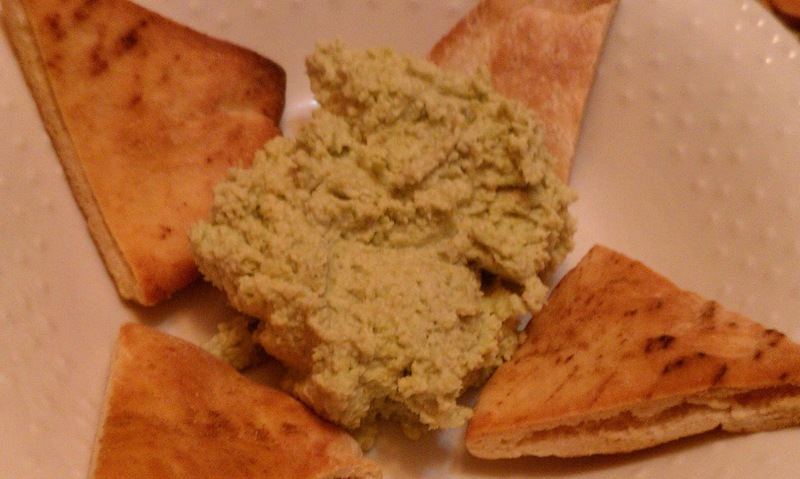 For the recipe go to Edamame Hummus. I too like to have healty, lighter snacks like this available..and this is easy, and with a little twist ...good recipie for us. Thanks! @kimba88 I hope you like the recipe! @momto8 It is very easy and has a lot of protein, which is great! @thevox It really is a great recipe, and very simple! @Krystyl I followed you back, have a great week! Okay, maybe I need more carbs, but I'm confused. What are you doing with hour. Shopping? Then mixing this up in 15 minutes? I personally would be noshing on the chips and pita bread all the while I'm making this...which would require another trip to the store. Delightful recipe and a great reprieve to all the sweets out there. @barbfroman The hour is from the cooling time in the fridge :) I love the pita chips also and have been known to eat them while waiting for the hummus to cool in the fridge! I hadn't tried hummus until earlier in 2011 and now I'm so addicted!! It's delicious and healthy. Martha Stewart is so on trend with the edamame hummus. I've actually tried this recipe before because I literally eat hummus every day and I love it! !